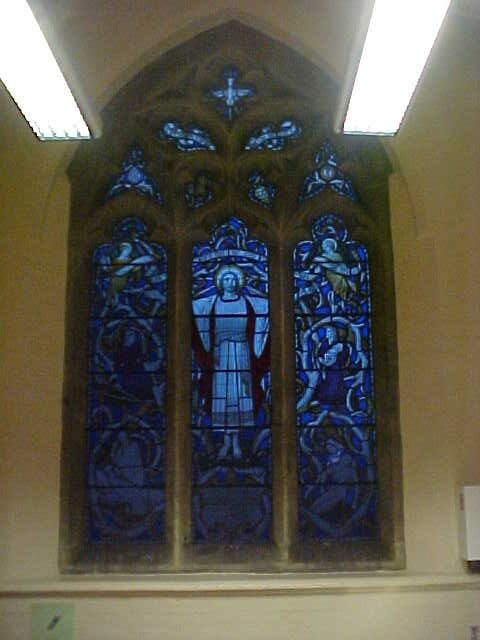 Stained glass window of three lioghts with smaller windows above. Left light: Angel holding a scroll with"I am come that they may have life." below which is a female patient with crutches and a chaplin ministering to a patient. Centre light: Depiction of Christ with arms extended. Right light: Angel holding the other end of the scroll below which is a women holding a baby and a nurse supporting a wounded soldier. IN MEMORY OF THOSE MEMBERS OF/ THE STAFF OF OSTERHILLS AND HERTS/ AND SISTERS HOSPITALS WHO DIED ON/ ACTIVE SERVICE 1914-18 & 1939-45.